You can find many things at Bookmans, from cult classics to action figures…if you’re lucky you may come across this lucky pup, who calls Bookmans home. Meet Fox the Chihuahua, (of the the many) beloved mascot of Bookmans Flag. With some of his history and adorableness you’ll quickly love him too. I’m sitting in my office with a small creature on my lap. He’s a chihuahua named Fox Mulder and he’s my little three foot shadow who follows me around my office at Bookmans and on hikes all over Flagstaff. He even walks two miles from home to Bookmans a couple of times a week proving that he’s one strong pup. After moving to Flagstaff last year, Melissa and I decided to adopt a Fox from a family in Cottonwood. We already had two cats but decided that it was time to bring a dog into our life. It was one of the best decisions we’ve made together. Before I worked at Bookmans, I was a regular customer and I found out that Bookmans was incredibly dog friendly. Even though Fox had some difficulty getting used to the store’s large size and numerous people, he started to find his comfort zone especially when the staff gave him treats. Fox Mulder dressing up in his most alluring costume at our “Monsters & Masks” kid’s craft event. In the past, I envisioned having a large dog like a husky that I could play rough. In spite of that, Melissa talked me into adopting little Fox instead which made sense since we only have been living in a one bedroom apartment. We brought Fox home last year and he was this tiny little creature that only weighed about three pounds. He was disgustingly cute to put it mildly (and still is). We were told that he was a “deer head” chihuahua which means that his head isn’t bulbous like the “apple heads” which are the stereotypical type of chihuahua. A year later, Fox has grown to eleven pounds and he’s become a strong dog for his size. If I were on a skateboard, Fox would easily pull me like a husky with a sled. I take him out for hikes a few times a week and he’s happiest trotting along trails at places like Buffalo Park, the Arizona Trail or Sandy’s Canyon. I studied some of the history of Fox’s ancestors and where and when his breed evolved and researched their origins after reading the book Living With A Chihuahua edited by Margaret Greening. It seems chihuahuas came from dogs call techichis that were originally companions of the Toltecs and may have been around since 300 BC. The Aztec’s conquered the Toltecs and incorporated the techichis into their religion. The little dogs were residents of temples and were cared for by the temple priests. It was believed that the techichis has the power to see into the future and also cure disease. 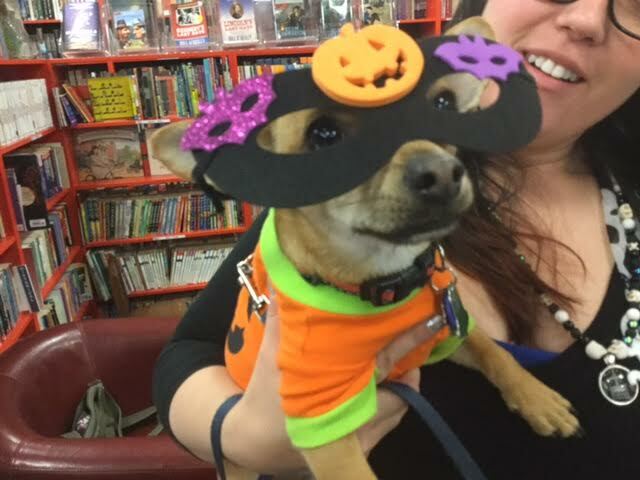 Whether at a kids event or perusing the orange shelves for a customer, Bookmans is proud to share dog love with everyone. We know they can be healers, helpers and put a smile on faces, and we are so happy to share Fox’s tale (ha) with you, from our very own Bookmans Flag.